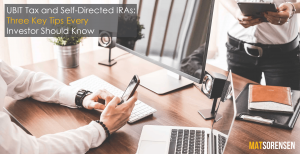 Unrelated Business Income Tax (“UBIT”) is often misunderstood by self-directed IRA investors and their professional advisors. In essence, UBIT is a tax that is due to an IRA when it receives “business income” as opposed to “investment income”. When we think of IRAs and retirement accounts, we think of them as receiving income without having to pay tax when the income is made. For example, when your IRA sells stock for a profit and that profit goes back to your IRA you don’t pay any tax on the gain. Similarly, when you sell real estate owned by your IRA for a profit and that profit goes back to your IRA, you don’t pay any tax on the gain. The reason for this is because the gain from the sale of an investment asset is deemed investment income and as a result, it is exempt for UBIT tax.